The Sun-Herald has had a chat with Danny & Aidan about their success in Edinburgh. You can read about it below. TWO men, four hands, four feet, 20 instruments and 48.5 minutes. When Mike Oldfield released his 1973 masterpiece Tubular Bells , it required more than 30 musicians to perform it. At the time, he probably would have laughed at two men who said they, too, could play it. Alone. A music jam around a campfire in 2009 led Blue Mountains musicians and childhood friends Daniel Holdsworth and Aidan Roberts, pictured, to start experimenting with the 1970s album, which sold more than 25 million copies worldwide. 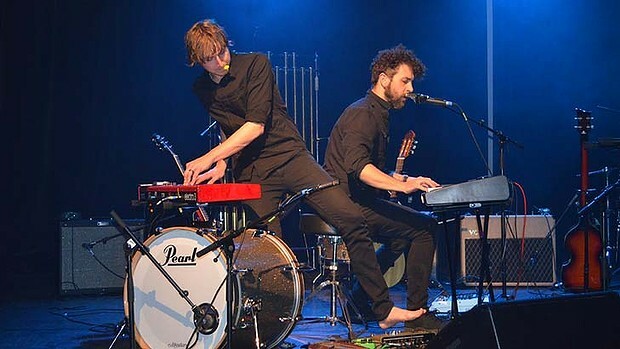 Whether it is the sheer suspense of watching the duo using their hands and feet to get across all 20 instruments, or that Oldfield himself performed an extract from the album at the London Olympic Games, the crowd at this year’s Edinburgh Fringe Festival has gone wild about the young Australians. Last week the pair, who call themselves Tubular Bells for Two and who also played at the Sydney Festival, were ranked on the aptly named ”festival medals tally” as the number one music show and third overall, against 3000 other acts. The crowd becomes more like a cheer squad throughout the show, Holdsworth told The Sun-Herald on the phone after one of their shows in Edinburgh.